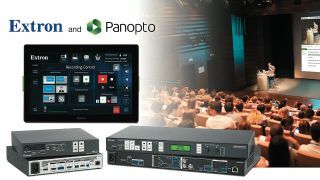 Extron and Panopto have formed a partnership to integrate Extron’s configurable AV control systems with Panopto’s media capture software and content management system. Matrox Graphics has begun shipping a fanless cooling version of its highest-density 4K IP decode and display card. Sony has launched its first Artificial Intelligence (AI)-based Edge Analytics solution, the REA-C1000. 1 Beyond has begun shipping the 1 Beyond AutoTracker 3 camera, the latest version of the company’s presenter tracking camera. Datapath has launched a new dual 4K capture card, the VisionSC-UHD2, ahead of ISE 2019. The first solution to use the company's new timecode sync and control protocol, UltraSync BLUE transmits timecode to a recording device over Bluetooth with sub-frame accuracy. Marshall Electronics will demonstrate its CV502-U3 High-Definition USB POV Camera at InfoComm 2018. The 1080p device is engineered for easy integration in spaces like huddle and conference rooms. Magewell is bringing its full product range to InfoComm 2018, including the debut of the new Ultra Stream HDMI standalone streaming encoder.